Wonder how long it will be until there are 1,000 copycat versions? Angry Birds Go! I've been playing PGo for the past few days. It's alright. Been to a few local Pokestops. Caught a bunch of Pokemon. I can see why people enjoy it, especially if you walk a lot or want to walk a lot, but it's pretty basic. My tablet's not really up to it though, so the app crashes a lot. Haven't been able to find/catch one in AR mode, I can switch to it but the Pokemon never appears. Nintendo Co. shares plunged by the most since 1990 after the company said late Friday that the financial benefits from the worldwide hit Pokemon Go will be limited. The stock sank 18 percent to 23,220 yen at the close in Tokyo, the maximum one-day move allowed by the exchange, wiping out 708 billion yen ($6.7 billion) in market value. After debuting in the U.S. earlier this month, Pokemon Go launched in Japan on Friday and became available in Hong Kong on Monday. 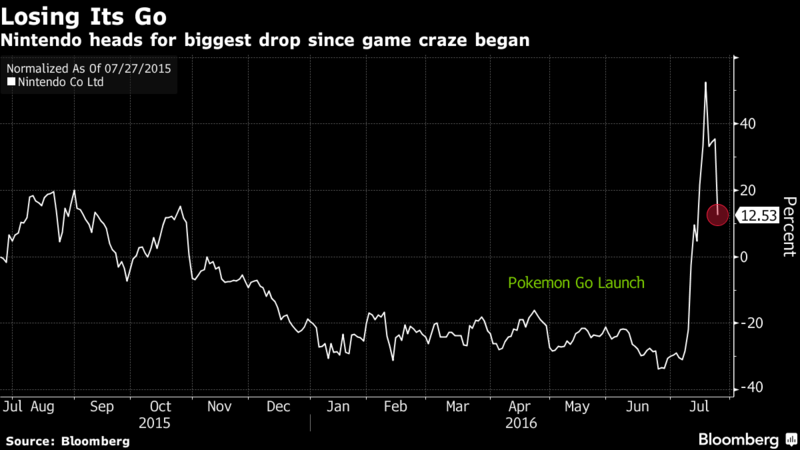 The correction comes after Pokemon Go’s release almost doubled Nintendo’s stock through Friday’s close, adding $17.6 billion in market capitalization. Nintendo is a shareholder in the game’s developer Niantic Inc. and Pokemon Co., but has an "effective economic stake" of just 13 percent in the app, according to an estimate by Macquarie Securities analyst David Gibson. “It’s still possible to say that in the short-term it’s overheated,” said Tomoaki Kawasaki, an analyst at Iwai Cosmo Securities Co. In a press release after the market closed on Friday in Japan, the Kyoto-based company said the game’s financial impact will be "limited" and that it is not necessary to revise its annual forecast even after factoring in current conditions. It also said revenue from Pokemon Go Plus, a Nintendo-produced accessory for the game expected to go on sale soon, has already been factored into the current guidance. The company will report first-quarter earnings on Wednesday after the market close, a period which ended before the release of Pokemon Go. The firm is forecasting an annual net profit of 35 billion yen in the current fiscal year, up from the 16.5 billion yen it earned last year. Short interest in Nintendo surged earlier this month as bears bet the stock rally had gone too far. As of July 20, short-sellers had built up a bet worth $940 million -- or 2.6 percent of outstanding shares -- that the stock would fall, according to researcher IHS Markit. At current prices, such a bet would have generated about $140 million in profits. Shares of related companies also fell. McDonald’s Holdings Co. (Japan), the game’s exclusive launch partner, declined 12 percent. Electronic parts maker Hosiden Corp., which Mitsubishi UFJ Financial Group Inc. said may produce Pokemon Go Plus, sank 16 percent. Besides the earnings announcement on Wednesday, Morgan Stanley said the next focus point is if Pokemon Go launches in China, where access to geographical data necessary for the game is restricted by the government. Investors are also waiting for announcements on Nintendo’s other upcoming mobile games and its next-generation console expected to be released next year, analysts Mia Nagasaka and Yuki Maeda wrote in a July 22 report. I work downtown, so there's a line of Pokestops down the road. On a typical walk after work, I can get just under 5 KM and hit around 20 stops. A statue outside the office is a gym, so that makes it pretty competitive. I'm almost to level 20 and it's starting to be boring, only because I'm not finding a lot of new Pokemon. These 22 Inappropriate Screenshots Prove You Can Play Pokémon Go Anywhere #2 is about to get killed, #3 has been at the dodgy vindaloo, #4 is being cooked & #9 well what can you say? Alex Rance is one of the best defenders in the AFL and almost quit football last year due to being a Jehovah's Witness. Now he's a Pokemon master. Really? I remember 1989-1991 as being Nintendo's biggest years pre-N64 because Sega didn't get big in the US until 1992. But those were the 3 years every kid got an NES. It was probably mainly due to the financial crisis in Japan at the time but the Genesis was selling well in the US in 1990 and the NES was starting to get old. For a while (possibly a short while) the PC Engine was outselling the NES in Japan and competing well with it for a few years which was around that era. There was also some antitrust cases and stuff like that happening in 1990. Hmm. Well, amongst my group of friends. Sega/SNES weren't desired until 1992. Maybe we were late bloomers. I know Sega was in America in 1990, but I don't recall it being popular here until 1992. It tied with SNES for a year, then Mortal Kombat broke sales off for Sega Genesis to take off until Playstation 1 a few years later as #1. The Genesis/Mega Drive became big in 1991 when Sonic came out. In the US it either beat or tied with the SNES from 91-94 and in Europe/UK/Australia the Mega Drive won overall. It bombed in Japan. If Sega didn't release so many add-ons and if they waited a year before rushing the Saturn out the Gen/MD would have remained competitive for longer, but they did and once Donkey Kong Country was released the SNES really took over. IIRC Mega Drive/Genesis was more popular in the UK as the games were cheaper. Some I remember had a price tag of like £65 for the SNES. I managed to find one soccer game called World Cup Striker on sale once for about £20 when it did retail for 65. Cheapest SNES game I bought was Madden 93 and that was about £12. Never paid full price I used to get them cheaper in a sale or preowned. Also if you just bought the cart pre owned that made it cheaper also. The games (exc. RPGs) were cheaper, the system was cheaper and Sega advertised and marketed their stuff better than Nintendo at that time in the PAL territories. He looks like Joe Pesci in that picture. Bandit wrote: Hmm. Well, amongst my group of friends. Sega/SNES weren't desired until 1992. Maybe we were late bloomers. I know Sega was in America in 1990, but I don't recall it being popular here until 1992. It tied with SNES for a year, then Mortal Kombat broke sales off for Sega Genesis to take off until Playstation 1 a few years later as #1. You aren't wrong, it was the same for me. Wikipedia wrote: In large part due to the popularity of this game, the Sega Genesis outsold the SNES in the United States nearly two to one during the 1991 holiday season. 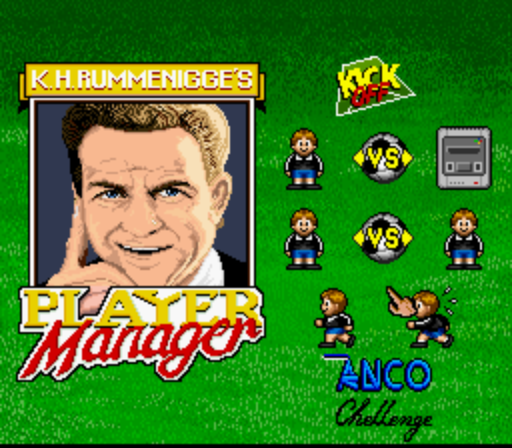 This success led to Sega having control of 65% of the 16-bit console market in January 1992, making it the first time Nintendo was not the console leader since December 1985. Sega was able to outsell Nintendo four Christmas seasons in a row due to the Genesis' head start, a lower price point, and a larger library of games when compared to the Super Nintendo Entertainment System (SNES) at its release. With the Genesis often outselling the SNES at a ratio of 2:1, Nintendo and Sega both focused heavily on impression management of the market, even going to the point of deception, with Nintendo claiming they had sold more consoles in 1991 than they actually had, and forecasting they would sell 6 million consoles by the end of 1992, while their actual U.S. install base at the end of 1992 was only just more than 4 million units. Due to these tactics, it was difficult to ascertain a clear leader in market share for several years at a time, with Nintendo's dollar share of the U.S. 16-bit market dipping down from 60% at the end of 1992 to 37% at the end of 1993, Sega claiming 55% of all 16-bit hardware sales during 1994, and Donkey Kong Country helping the SNES to outsell the Genesis from 1995 through 1997. There are countless unofficial Pokémon games out there, from hacked ROMs to entirely original works. But version 1.0 of Pokémon Uranium, released for Windows PC earlier this week, may be among the most ambitious. The free game has been in various stages of development for more than nine years, its creators say, making the Aug. 6 launch a major milestone for the full-length, original Pokémon adventure. Pokémon Uranium, according to its official Wiki, takes place in the Tandor region, where many classic Pokémon have become infected by nuclear radiation. The trainer — one who can be male, female or gender neutral — must stop these monsters from wreaking havoc across the land, all the while collecting gym badges and trying to become a Pokémon master, as per usual. Among the features offered in Pokémon Uranium are three playable characters, a new region to explore, online battling and trading, a Pokémon speech translator (!!!) and more than 150 new Pokémon to capture. That’s just scratching the surface of what’s listed on its Wiki page and website, which the pair of lead designers — known as JV and Involuntary Twitch — have maintained during the lengthy development cycle. No emulator is required for Pokémon Uranium, even though its developers consider it to be an homage to the classic Game Boy Pokémon adventures. Instead, Windows PC players may simply download the file; Mac support is reportedly in the works. Some have already had the chance to play the game in beta over the years; save files from these versions won’t work with the new, full game release. Despite that, and despite the years in production, fans’ hopes remained high for the full Pokémon Uranium release. Following the release of version 1.0, the website’s servers went down for hours "due to extreme amounts of traffic," the creators wrote on Tumblr. JV and Involuntary Twitch have continued to answer fans’ questions about the game and the status of the servers since launch, even as the game racked up thousands of notes on Tumblr and comments on Reddit. A patch that brings the game to 1.0.1 went out earlier today to fix several bugs, and players are encouraged to post on the forum about other issues. Development continues on, even after nearly a decade. Time will tell if Nintendo or The Pokémon Company try to put the kibosh on the project, but several other fan games live on without issue. For those who prefer Pokémon on handhelds, Sun and Moon are out in November on Nintendo 3DS, and Pokémon Go is now on smartphones.